A cocktail crowd mingles gregariously in a blithe atmosphere, casually glancing at their watches. Next show starts in a half hour - plenty of time to put back a couple of Martinis. Backstage, a world-class styling team is far too experienced to be relaxing at a time like this. They feverishly put the finishing touches on stunningly sculpted hair, minutes away from the payoff. The show is a smashing success, and the biggest smile is on none other than Fritz Laboucane, Creative Director for Vidal Sassoon Canada. 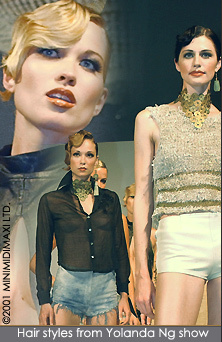 All in a day’s work for Fritz, who spearheaded the majority of shows at Spring/Summer 2002 Toronto Fashion Week. We caught up with him at his Toronto office, where he discusses the closing show, Yolanda Ng. Touring southeast Asia, working on London Fashion Week and opening lines of communication between Vidal Sassoon’s worldwide bevy of salons and schools keeps Fritz both current on global trends and on the cutting edge. Vidal Sassoon customers appear to demand this level of expertise. 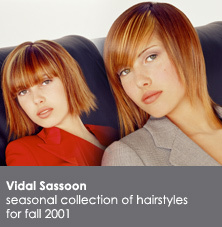 Vidal Sassoon even releases a seasonal collection of hairstyles on cd-rom, leaving six months to think about what to wear with the new do’s. Talk about trend leadership. 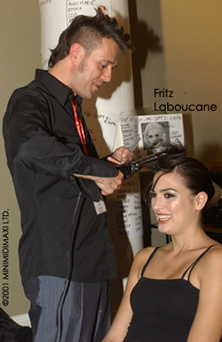 Fritz began his career at Vidal Sassoon Canada in 1984 as an apprentice, and rose quickly in the organization. Celebrities bring in the dresses they plan to wear and we put together a look. MAC is on location to take care of make-up. We like to think of it as a one-stop salon. ” As if that weren’t enough, Vidal Sassoon Canada gets swamped with bookings every September for the Toronto Film Festival. They have obviously perpetuated and enhanced the vision that puts Vidal Sassoon in the upper echelons of hair styling. At 39, a realistic attitude keeps Fritz in touch with his customers. Fritz is enthusiastic after participating so extensively in Toronto Fashion Week. One wonders what could possibly be on the horizon for this fashion dynamo. The answer is simple.